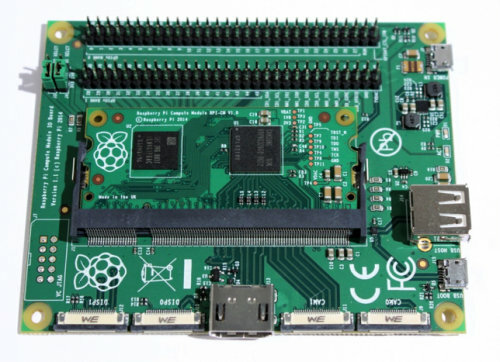 Albeit the initial goal of the Raspberry Pi board was to address computer science education, it has become extremely popular with hobbyists, has made its way in many different kinds of hardware, and is now clearly the number 1 low cost ARM Linux development board. The Raspberry Pi foundation has then decided to design and sell a system-on-module called Raspberry Pi Compute that people can use in actual products. The main difference is they’ve replaced the SD card slot found in the board, by an eMMC module which is more appropriate, and should provide better performance, for products. The foundation has also made a baseboard called “IO Board” for the Compute Module, in order to kickstart development while your custom PCB is being designed. It includes an HDMI output, a full sized USB port, 2 micro USB ports, some flat headers for camera and LCD displays, and two 2×30 pin headers to easily access the signals available via the SODIMM connectors. 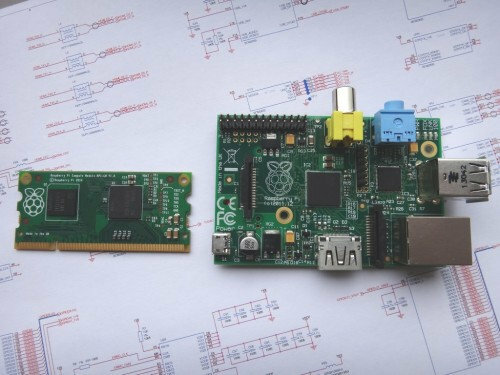 The module will most probably support all distributions available for the RPi (Raspbian, Fedora, Arch Linux ARM, etc..) as source code and tools should be identical too. The IO board will be open source. For now the foundation has only released the schematics of the IO Board and Compute module in PDF format, but more documents will be released soon. A “Raspberry Pi Compute Module Development Kit” comprised of the Compute Module and IO Board should be available from RS and Element14 in June. The price of the devkit has not been disclosed, but the Compute Module will start selling in the summer for $30 per unit in batches of 100. Individual orders will also be possible at an higher price.